Testimony Assembly Social Care Limited (TASCL) was established to provide personal care services to people in the community. 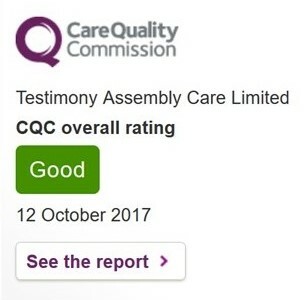 Testimony Assembly Social Care Limited provides Home Care and Support Services, including Shopping, Living in Services, Medication Supervision and Administration. We take referrals from organisations and private individuals. The aim of Testimony Assembly Social Care Limited is to provide a flexible service that will improve and sustain people's overall quality in the community and assist them with various needs. We maintain social care standards by keeping dignity, privacy, independence, choice and respect, when delivering our services. There is much more to come! Older Adults and physical Disabilities. Older Adults (Age 65 and Above). Younger Adults (Age 18 and Above). Location: Gem Building, 20-21 Hockley-Hill, Birmingham, West-Midlands, B18 5AH. Contact details: Phone numbers: 07737047287, 01215546950, 07966934643. Monday to Friday. 10AM - 5PM.